I'd like to be able to set the autopilot destination while docked at a base. Right now the game says I must undock to set it. Is there a reason you want us to undock to set the destination? Ideally this would allow us to set it while docked. Then undock. Then press X to go. The interface that shows the galaxy map while you're docked leads you to believe you can set the autopilot destination. 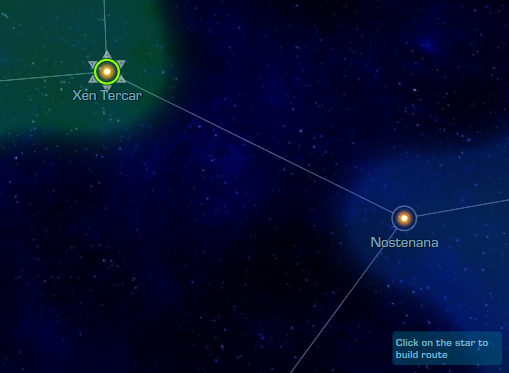 It prompts you to "click on the star to build route" and draws the path overlay when you do. Also the "Autopilot" button then appears inviting me to click it! I understand you can only turn on the autopilot after you've undocked but I don't see why we shouldn't be able to at least set the destination since the interface already supports everything except the final step. The change in behavior would be that when we click the "autopilot" button while docked, the destination is set and then we are prompted "Destination Set! Undock from the station and press X to engage the autopilot." This is a change that I think would streamline the game. I'm sure I'm not the only player that is checking quests and looking at routes while docked. If you wish to leave it like this I feel it will be less confusing to players if the "Autopilot" button doesn't appear when you're docked. It is still quite useful to show the route between systems so you can plan your loadout and make sure you won't be traveling through a hostile system that you don't want to. I'm still having a lot of fun with the game. Thanks for listening! askew1, thanks for explanation. Sure, it seems reasonable and very easy to implement.